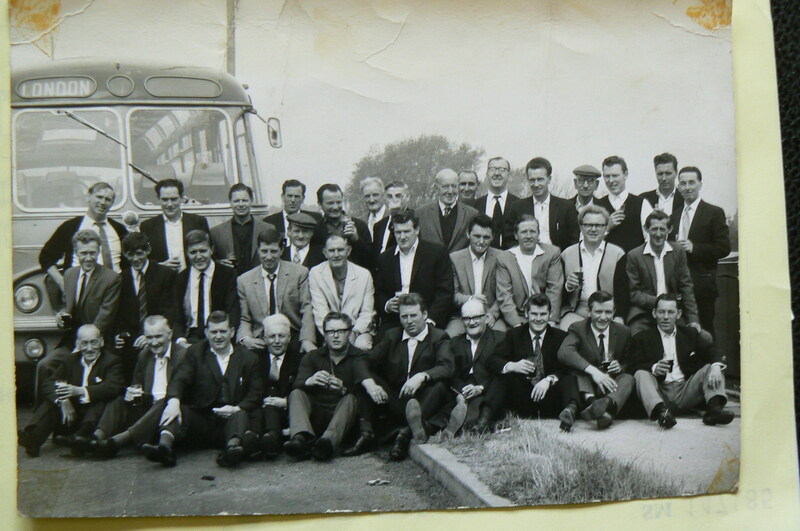 Charabanc (coach) outing to Southend from the old Submarine club in the 1960’s. I remember some names, but not all. Back row from the left: 1st Ron Bishop, he owned and drove the coach, 11th Bert Story. Second row from back: 1st Bobby Lee, 2nd Reg Haslett (me) 3rd Charlie Connors, 4th John Oliver, 7th Peter Cleary, 10th Billy Strange. This page was added on 08/06/2017. Re, where is submarine club. It was the other side of the station. I met my husband there on my 17th birthday 6/9/1952. He was on leave from the army and looking for his brother. I believe my brother John Oliver and friends helped to build this club. Wow, familiar faces. My brother, John Oliver and Bob Leigh plays bowls up here in Northants same club as me. Several others I know too. The submarine club was the old Workings Mans Club under the Station walkway on the other side from South Oxhey. When demolished, the new Working Mans Club was built near the shops at the top of Hayling Road. A really nice photograph that I am sure will bring back memories for many people. I have not heard of the “Submarine Club” can you tell us where this was situated?